Cassida Apollo - Technology Unlimited, Inc.Technology Unlimited, Inc. The Cassida Pro Series Apollo 1-Pocket Currency Discriminator packs all of the power of the successful Zeus discriminator in a new, more affordable single-pocket platform! 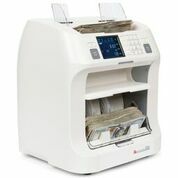 The Apollo features outstanding bill recognition, advanced counterfeit detection and detailed reporting functions to help your business stay on top of all high-volume cash handling needs. Advanced Counterfeit Detection: Defeats even advanced counterfeiting techniques with magnetic ink, ultraviolet, infrared and color spectrum analysis checks. A History of Success: The proven platform of the Zeus'” in a new, more affordable one-pocket solution. Convenient Design: Ideally-located storage shelf provides a perfect place for batch bands, pens and more.